Already into June (more than a day's worth, even). We're just burning our way through the year. And "burning" is the right term, considering temperatures in the US, at least, this week. Oof. It's a good time to stay inside in the AC and get some gaming on. And if you're gaming, you're going to need a gaming table. And if you're going to need a gaming table, it might as well look as good as possible. That's what we're here to help with today. 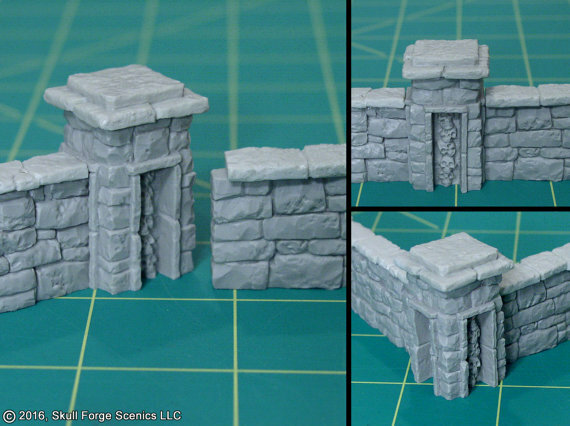 Our Terrain Corner today has: Dicey Ventures Elemental Village Kickstarter Launches, Tabletop World has released the new Town Walls, Badlands: Pwork Wargames Fantasy Gaming Mat Now Available, New Resin Terrain from Skull Forge Scenics: Graveyard Wall Sets, and Manorhouse Workshop Update #33 – Some expensive fuel. 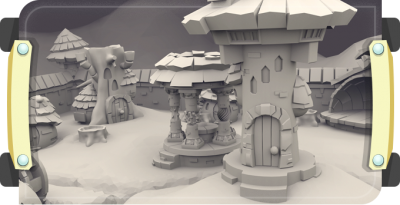 Dicey Ventures Studios is very happy to welcome you to our second Kickstarter Campaign, featuring the 28mm fantasy terrain set, the Elemental Village. The Elemental Village is a set of 28mm fantasy terrain that is designed to be used with and for any tabletop wargame or adventure game. Unlike most of the cookie-cutter, medieval style terrain that's currently available, the Elemental Village offers a completely new aesthetic experience for your tabletop battles and adventures. Designed with just the right combination of cartoon proportion, chibi-style cuteness, and fantastical whimsy that is more commonly found in video games, the Elemental Village takes each of the five most common fantasy elements and brings them to life with character and flare. 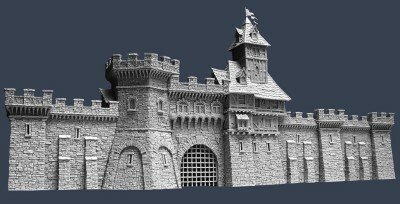 Use the wall sections to form the medieval fortified town to your liking! With this system you can make a long straight fortified wall. In the future we will add corner towers which will allow you to completely enclose the town with protective walls. In time we will develop different add-ons which you will be able to incorporate to your existing and growing fortification. 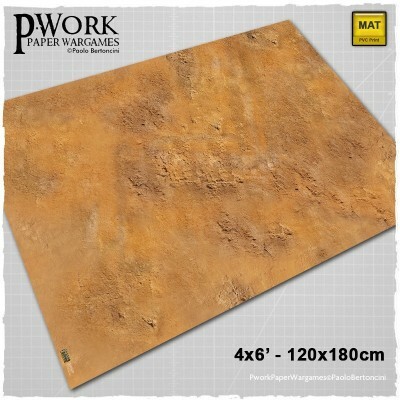 The Game Mat Badlands is a PVC or CLOTH made rollable terrain mat, ideal for wargames, in size 4x6’ (122x183cm), 4x4’ (122x122cm), 3x3’ (92x92cm), 3x6' (92x183cm), representing the scenery of a bare plain of reddish earth, with the ground cracked by the fury of the elements. 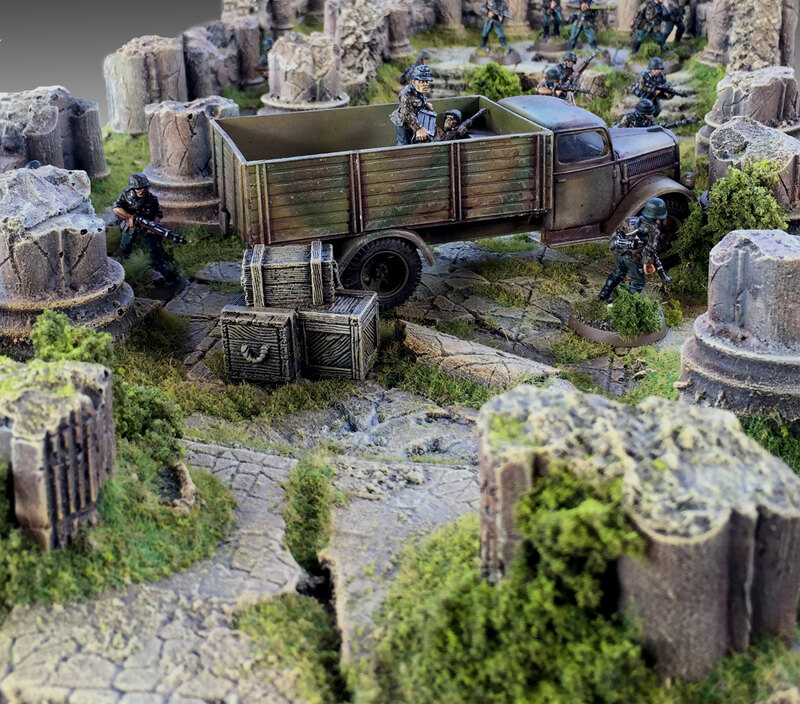 The Wargame Mat Badlands offers the possibility of setting battles between armies of miniatures among large open spaces, dusty pahts and rocks eroded by wind. The mat is a perfect fantasy setting for deploying vast armies, and also ideal for historical game settings or science-fiction fights! Are you ready to battle? 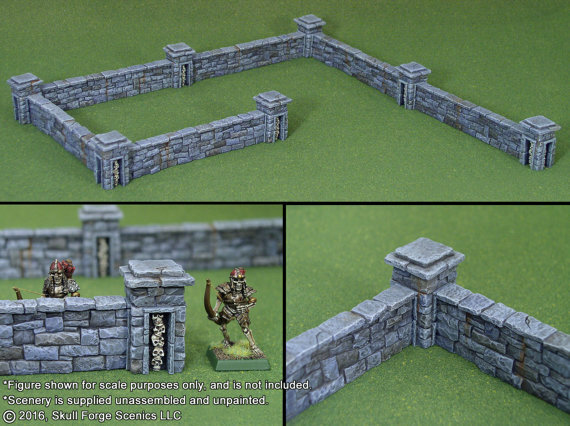 These beautifully sculpted wall sets are comprised of 5-inch sections of stone walls and connecting wall posts. The wall posts have a recessed column of skulls on each side, and the walls are designed to insert into the columns to form seamless end caps or corner intersections. 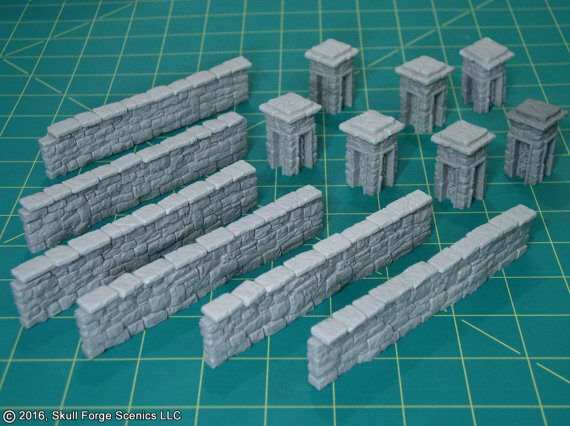 Loose wall posts also make great bases for statues and monuments. All the kits are designed, sculpted, and cast by Rob Hawkins. His production studio is based in New Jersey and ships worldwide. 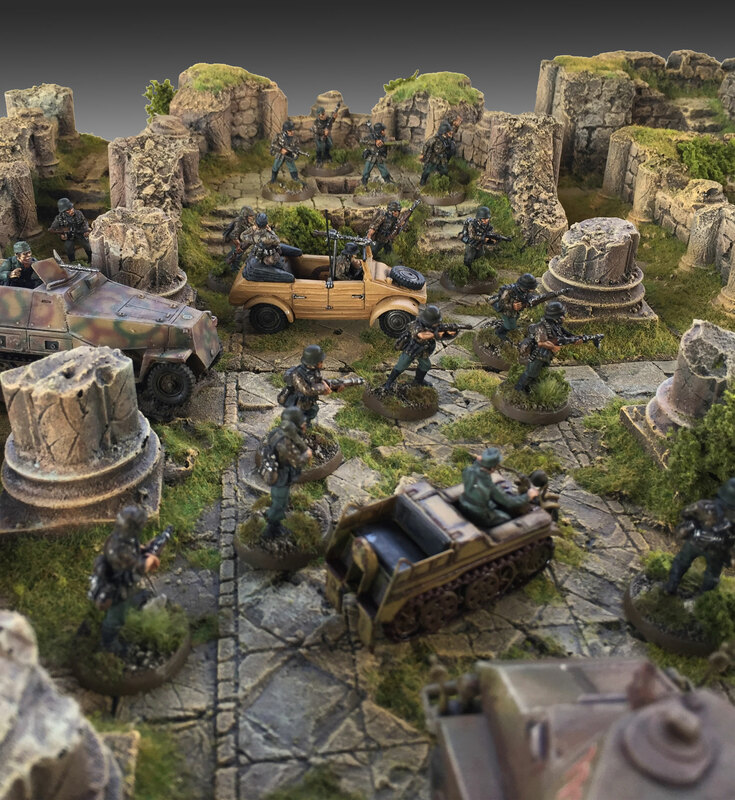 We did in the past a lot of pictures of our 3D Bases with fantasy miniatures, but what about some other historical period, like World War II ? 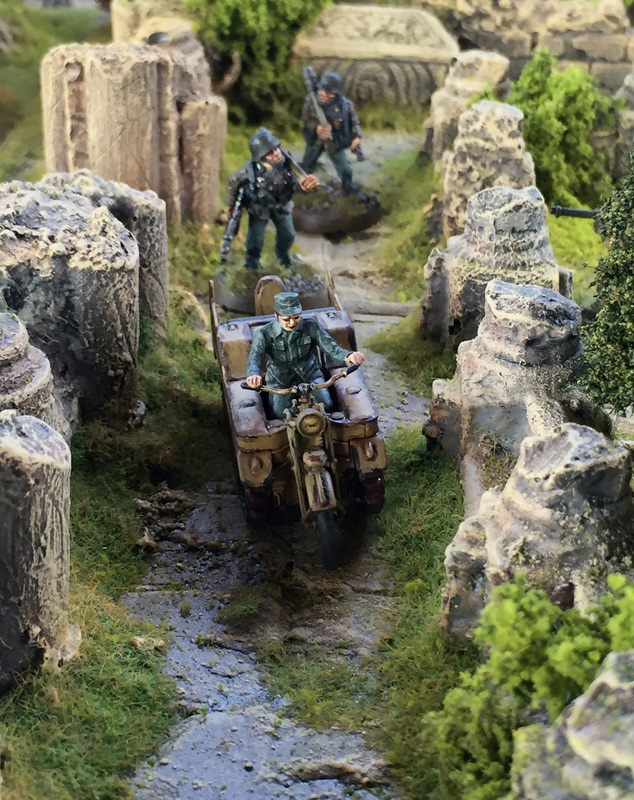 A lot of you asked us about it, so, with the help of our dear friend Massimo Torriani – expert of WWII and gaming rules creation (“Operation World War Two” – “Operation Squad” and “Assault Platoon”) we did just that, and prepared some pictures of our Abbey with some very peculiar war action.